Squirt is a New Generation emulsion chain lubricant! It was developed to give better lubrication, last longer and keep the chain clean over long distances, for both mountain and road. Nothing beats it in dry, dusty conditions! I switched to this after using up a huge bottle of Pedros Ice Wax and this stuff is much, much better. It goes on thick and once you let it dry it stays there but doesn't attract any dirt at all. It's good in wet and dry conditions. As a bonus it also coats your chainrings and cogs with a protective layer of wax. after riding the trails all I have to do is quickly brush of any debris from my drivetrain and re-apply. On the road bike I just put some on sometimes it always seems clean. For the first application make sure you STRIP all existing lube from your chain with solvent. The first couple of applications may not last so long but once a base is built up this stuff is the best. I picked this up after FrictionFacts found it to provide the lowest chain friction of any commercially available lube that they tested. I can't claim to notice the couple of watts of improvement this is giving me compared to my previous lube (Dumond Tech Lite) in terms of speed or time, but I do notice that my drivetrain is quieter and smoother feeling. I haven't tried Squirt in wet, muddy conditions yet, so I can really only speak to its performance in dry conditions. I've been riding XC for almost 15 years, and I can say without a doubt that this is the lube. Nothing is like this one, red Finish Line, Pedros and so on. Your transmission will keep clean even after several rides. Give it a try, the South African made a superb lube! I had been having an awful time keeping my drive train lubed in the dry, dusty Reno-Tahoe area riding. As if the dust isn't bad enough, throw in the occasional stream crossing and all lubes start crying. Every oil based I've tried works for ~15 miles. After that it's a feeding birds neet. Squirt has been keeping it quiet for ~40 miles. Phenomenal! Also, I haven't had to degrease yet. Just squirt some more on the night before. 4 stars for value. It's a bit pricey and hard to find. Highly recommended for dry areas. best lube all around. I have been using for years. I have used many different lubes over the years and have settled on Squirt. It might need to be applied more often but it really works well and maintains things clean. I do long rides with water crossings followed by sand here in S Ca. Anything else gets really dirtly and starts squeaking by the end of a ride. This is all I use now on my road and mtn bikes. I've tried them all--wet, dry, wax based, petroleum based, etc. Nothing comes close to the staying power and longevity of this stuff in dirty, dusty, dry conditions. It does leave a little to be desired in wet conditions, not lasting very long--but if you're like me and live in a place where it rains only a couple times a year, this is the lube you want. Use it on all your bikes; road, mountain, cross, whatever. OK, so you gotta start with a CLEAN chain, and it wouldn't hurt to clean up your cogset, too. That said, this is great lube. Put it on, run the chain, let it dry. Don't worry about cleanup or excess; and when you gotta add more, add more. It works, it lasts, AND if you have to mess with your chain while you're out on a ride (like a rear tire change, or unrecoverable chain drop), your hands won't look like an industrial waste site when you're done. great stuff! and very comparable to Boeshield T9. buy whichever one is cheaper. Decent winter lube. great summer lube. much better than white lightning and the rest of them. Keeps my chain lubed and clean. no sticky mess and grim accumulation. perfect for our dry conditions in Western Australia. I've tried every chain lube under the sun and I always come back to this stuff. Use it sparingly and only apply one tiny little drop per link, letting it dry thoroughly before putting any miles on it. My only real complaint about it is that is does not hold up well in wet/rainy conditions... but for dusty, dry condition, nothing will even come close to this stuff. It lasts a LONG time between applications and keeps your drivetrain clean. A 4 ounce bottle lasts me about 6 months between 4 bikes that get ridden quite a bit. Doesn't collect grease and isn't bad for the Earth. This is my favorite chain lube. This is the best lube I've used in my 20 plus years of mountain biking. It is made for dry climate where dirt and dust kicks up on the bike. Squirt keeps my drive train clean vx the other lubes I've tried in the past. I have used this for about 2 weeks now. I commute by bike every day and it rains a lot in Portland, OR, so half my riding has been in rain and the other dry. This stuff kept the chain quiet for over a week after liberal application. I just applied it again without cleaning the chain first to see what it does. So far it's been great. This stuff is a lot thicker and lasts a lot longer before needing reapplication compared to something like IceWax, which I was using last summer season. I use this product each time that I use my bike. Previous I brush the chain and the apply de oil. Great product. Works great for both road and mountains! I think standard wet lube is the better lubricant overall. Problem is in places like the desert southwest a wet, oil-based lube just attracts a lot of dust, which creates a grinding paste. Defeats the purpose of reducing friction. This stuff doesn't attract as much dust. Works great! My favorite wax-type lube I've tried so far. This is by far one of the best chain lubes I’ve ever used. Been using this stuff since it first came on the market and i wont use anything else. Shifting is great and keeps your drivetrain clean. I've been using Squirt for three years. Non=toxic, eco freindly, and proven by a number of lab tests to both decrease wattage an prolong chain life. I'd say the latter is true. As for the former, tough to say. The only downsides are that the chain runs a little loud (wax doesn't damp sound like oil) and you have to reapply it often, especially in wet weather. But no more greasy rags and nasty cleansers. Great lube for dry or wet weather. Not great for mud pools but neither is most lubes. Also very environment friendly and easy to apply. Used many lubes for chains over the years ranging from White Lightening, Parrifin Wax, dry lube and even Automatic transmission fluid on bicycles and motorcycles. 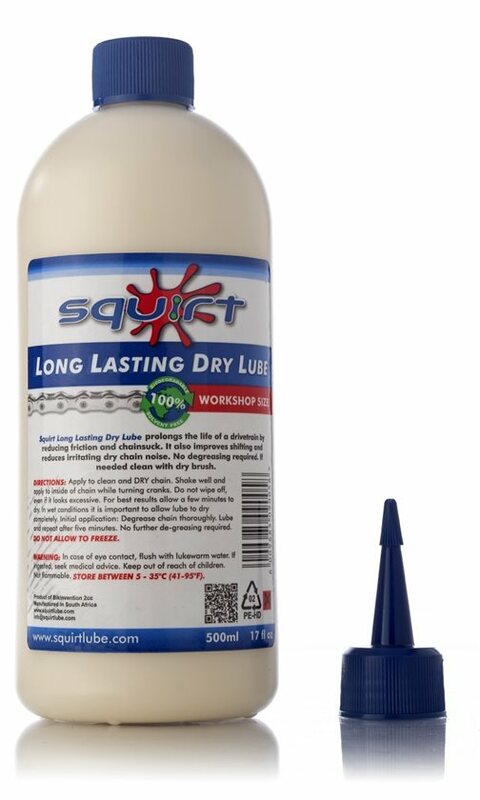 I've finally given up my search for a long lasting lube that stays clean with Squirt. After your ride, clean your chain and put one drop on each link. Run it through the gears and let it sit over night, no need to wipe it clean and no need to lube the chain every ride. Hands down the best chain lube out there. Was using Maxxima chain lube before and Squirt is way better for longevity between applications. I got a giant effing bottle which will likely Outlast me. So far so good. Works great to keep my chain quiet and clean. Excellent product if you follow the directions and install your new chain after it has been degreased. My chain looks clean longer and is quieter than other previous products. I live in a dry environment of Southern California and its perfect for the weather here. The bottle is small and you need very little to lubricate the chain. I have been using it in Spain for years... and in the USA I won´t stop! Clean and durable! The only issue is that you have to clean the chain almost perfect before using it the first time. Excess is good with this lube! The longest lasting , no mess chain lube in the business. Put in on,let it sit overnight and then ride, that’s it! Quiet, smooth shifting and clean! Also easy to use (apply). Best dry lube so far. This lube works good but there is build up in the chain ring area. I was really hopeful for this lube, and thought it would be my favorite based on the reviews that it's gotten, and the praise it got from one of the guys at the local bike shop. This lube applies easily, but it is very thick. It applies yellow, and dries clear in about an hour or so. Per the directions, I applied it heavily to the chain and spun the cranks a few times. Based on its thickness, I thought it was going to end up looking gloppy on the chain like the white lightning did. However, the next morning, the lube appeared to distribute itself evenly, and there were no glops on the chain. It did not set up as "dry" as the White Lightning. It dried to a consistency somewhere between a wet lube and a dry lube. Obviously, I am extremely disappointed with this lube and would not recommend it. Other than the ease of application, this lube didn't do it for me.